The wind that runs over you, the speed, the adrenaline that runs through your body. Unforgettable. Describing in words what it feels like during a free fall is almost impossible. 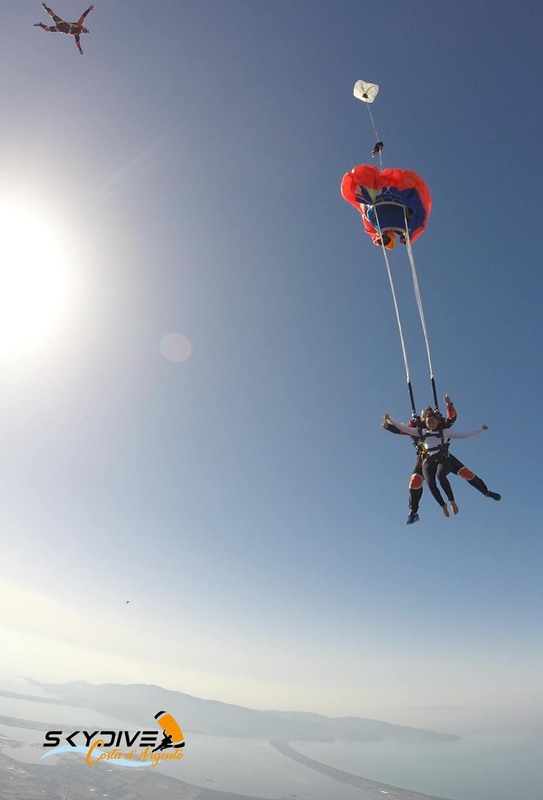 In the tandem jump you will be connected with a sling to the instructor who will guide you for the entire jump, from the plane exit to the landing with the parachute open. 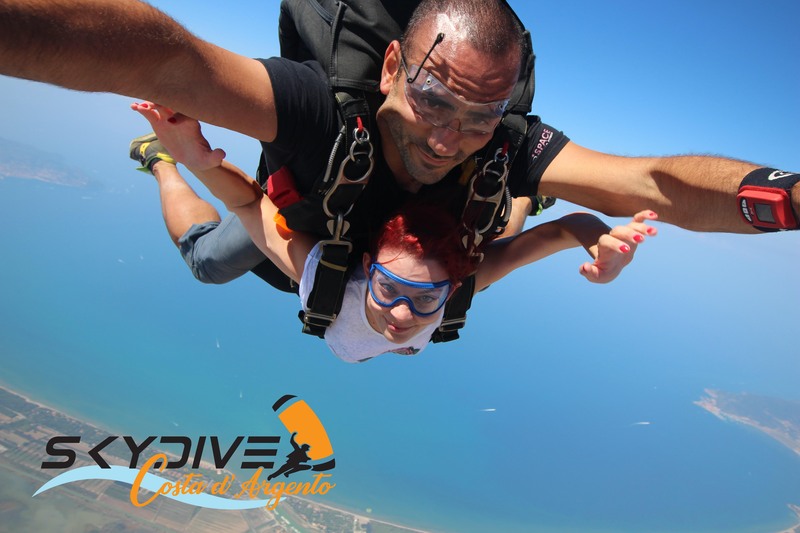 Once in our Skydive, you will meet the instructors who will jump with you, who will provide you with the equipment needed for the launch and give you basic knowledge on how to behave during the fall. At the time of your turn you will get on the plane that will take you to the launch altitude, 4200m. From up there there is a breathtaking view! The moment has come. Put the insecurity aside and ... jump! You will reach the speed of 200 km/h and you will experience mixed feelings, fear, fun, adrenaline. Once you have opened the parachute you can enjoy a unique view of the Orbetello lagoon, the Argentario promontory and the Tuscan Maremma. After a few minutes you will again be down to earth and you will look forward to doing it again. In the meantime, you can look at the photos and videos of your launch. 1Who can make a tandem jump? All those who wish to try this adrenaline-filled experience, starting at age 18, or 16 years with parental consent. 2Is the medical certificate mandatory? For the tandem jump, a medical certificate is not required, but it is advisable to seek advice from your doctor if you have any disease or treatment in progress. 3Do I need a course before launching? No. During the tandem jump you will always be assisted by the instructor who will fly with you. In the initial brief you will learn how to behave during the phases of falling and landing. Our goal is to make you have fun safely. 4Do you need special equipment? Nothing more than what is provided by us upon arrival. The main thing is the desire to get excited. We recommend comfortable clothing and closed shoes. In summer jeans, a t-shirt and sneakers are perfect, in winter it is better to dress heavier, with a throat protection (eg a neck guard). Above you will still wear our suit and our glasses. 6How long is the jump? The plane takes about 15 minutes, the free fall about a minute and after the parachute opens it takes about 5-6 minutes to reach the ground. 7More useful info to know before jumping? You must not have dived in the previous 48 hours and you must not have taken alcohol before jumping. Also, let the instructor know if you wear glasses or contact lenses, he will provide you with the right equipment.